It’s a new year and what better way to start it off than with some new spell ideas? 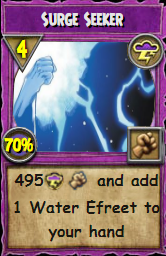 Thanks to Legends of The Spiral’s awesome Card Creator tool (link here) I am able to bring these spells to you in the clearest way possible. Today’s article will center around a new spell mechanic I envision: Seeker Spells! What is a Seeker Spell? A Seeker Spell would be a type of spell that, when cast, adds another spell to your hand. 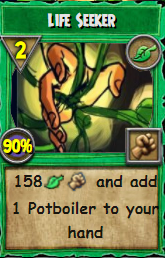 The spell added to your hand would be added as a regular spell card, allowing you to enchant it. Seeker spells have numerous potential applications: they could allow you to summon copies of cards that you don’t have in your deck, and they could allow you to summon a card exactly when you need it. However, for my first batch of Seeker spells, I designed them to summon TC and item cards that typically aren’t available to the players to train or purchase. For the PvP top tiers, I designed spells that would be useful in PvE, while I gave the low tier PvP classes more potent PvP tools. In order to balance Seeker Spells’ powerful summoning effect, I made them deal 10% less damage than their equivalent pip counterparts. All Seeker spells would be acquired at level 78 via side quest. 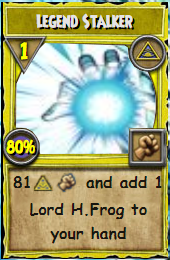 Explanation: As a top tier PvP school, I allowed the balance spell to add a PvE card to their hand. Balance struggles with Balance mobs and has no off-school AoE spells until level 108. Lernaean Hydra neatly addresses this issue. Explanation: Death in PvP struggles to spike damage, especially from second. 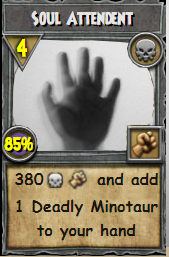 Deadly Minotaur addresses this issue while becoming more potent with the ability to further enchant it. 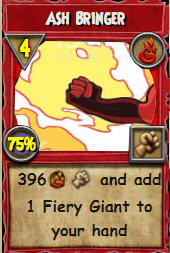 Explanation: As a top tier PvP school, Fire’s seeker spell also gives it a PvE oriented spell. Between Meteor and Raging Bull – Fire has no burst Damage AoE, Fiery Giant bridges that gap. 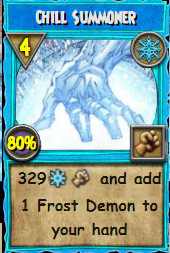 Explanation: Ice’s spell gives it a much needed high damage single hit for use in PvE. Explanation: Life is in need of a low pip AoE for PvE and Potboiler certainly fits the bill. Note that Life’s spell was given a reduced cost of 2 pips to allow it to instantly use Potboiler the round after. There is little point in a low pip AoE if you still need to wait the same number of rounds to cast it as you would with Forest Lord. 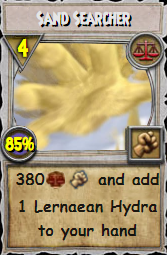 Explanation: A spell that offers less combo utility than Medusa, but does a lot more damage. Its nature as an AoE also makes it useful in PvE as a hard-hitting AoE until myth receives Mystic Colossus. Notice that myth’s spell was given a reduced cost of 1 pip. This is due to the fact that Lord Humongofrog would have to compete with Medusa and (in a PvP environment)-the more rounds Myth spends without stunning, the more likely they will not be able to stun at all during the match. Explanation: Storm has no offensive/defensive utility and struggles to deal with enemies in the late game. Water Efreet makes great strides towards mitigating this issue. What Do You Think of Seeker Spells? Could Summon in the Comments Below!